Most of our laying hens are birds we start from day old chicks. A couple of flocks were adopted, but most are farm raised. Earlier this year we started a flock of about 60 hens. 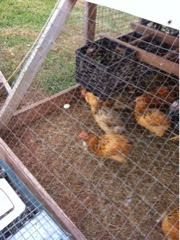 Some came to the farm from a local, in school hatching project. Some are our anniversary Silver Lace Wyandottes. And the rest of the flock are Arucanas, the green egg layers. The first egg in their pen! Because it is white we know it came from a white leghorn, one of the birds from the hatching program. Our Wyandottes will lay brown eggs and the Arucanas will lay blue/green eggs. The hens are all the same age, the bird bred for production starts first. She will also lay longer before going into a molt, and will produce more each day. Can't wait for the rest to start! And for them to put them into their nest boxes.